The first game of the West Regional tournament proved that the Coyotes could make adjustments on the court in a matter of seconds to stay ahead of the competition as the Coyotes beat the Alaska-Anchorage Seawolves 3-1. “We knew it was going to be a very physical match. They’re big, they jump very well. I thought they did a good job with some blocking matchups,” said Coach Cherniss. The Seawolves developed a strategy in which they would purposely hit the ball to the Coyotes’ All-American setter, Camille Smith, disallowing her to set up her teammates for potential kills in the process. The ladies quickly adjusted to the plan. “They tried really hard to frustrate both Megan and Sam with balls in front of the setter. We said okay, we’re going to give balls to P (Priscilla Collings) and Mo (Morgan Carty) and Dani (Danielle Newcombe),” said Cherniss. Senior Priscilla Collings had a game high 13 kills. Samantha Middleborn and Morgan Carty had 12 kills apiece. Megan Johnson closely followed with 11 kills and a .421 hitting percentage. At one point in the game, Johnson wasn’t getting very many opportunities to display her talents. “After looking at the stats we decided we need some Megan Johnson to blow this place wide open,” said Cherniss. “Megan does a great job of getting up and transition. She’s a total work horse,” continued Cherniss. The Coyotes had an overall better kill percentage than the Seawolves with a .324 versus .233. The Seawolves did out-block the Coyotes however with 10.5 blocks compared to 6. “I think they had an opportunity to grow throughout the season,” said Cherniss of the Seawolves. “Going into the postseason, we’re seeing everybody’s best. We’re seeing champions on the floor,” continued Cherniss. The ladies feel that a large part of their success can be accredited to the chemistry they have on the court. They trust each other’s abilities to play and win. “That chemistry we have is unbreakable, you can’t break it,” said Camille Smith. CSUSB women’s volleyball team dominated in match two of the NCAA West Regional Semifinals against the BYU-Hawaii Seasiders. The Coyotes were able to play consistently throughout this second round matchup despite the fact that they dropped a set, winning the game 3-1. Middleborn conquered the net with more than a handful of blocks. During the first two sets, CSUSB’s defense was aggressive and kept them in the lead. “Our defensive is absolutely unbelievable from a blocking standpoint and from a floor defensive standpoint,” said Camille Smith. “We have been consistently underrated as a defensive team because we have such great attackers,” said coach Kim Cheniss. There was an impressive display of digs and blocked kill attempts all throughout the night as the Coyotes made it seemingly impossible for the Seasiders to gain any type of momentum. “Defense definitely changes a game and it helps because our level of defense allows me to run our offense and in the end, our offense is what is going to win our game,” said Smith. 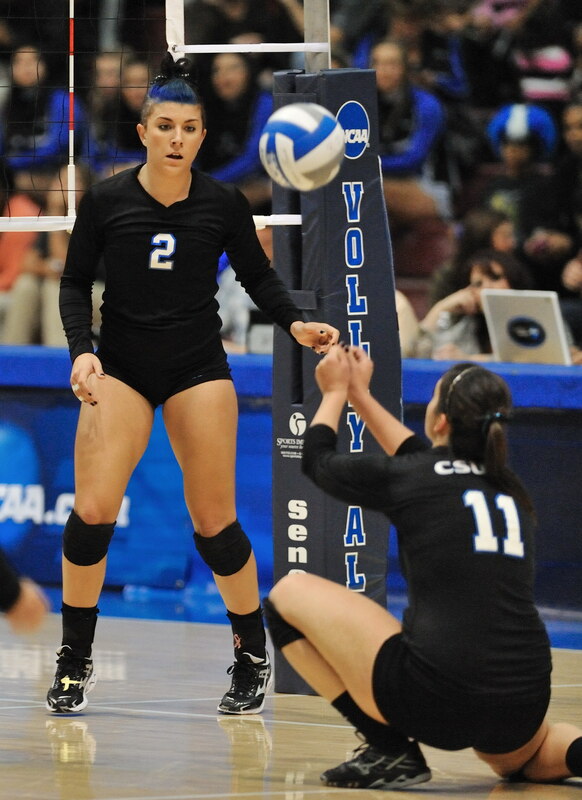 After dominating the first two sets, CSUSB found themselves in a real dog fight in the third set. A few questionable calls by the line judges only made the task of putting the scrappy Seasiders away even more difficult. A call was made by one of the line judges in which a all that appeared to have landed in between the lines was called out. Fans booed, and the Coyotes protested as well. “I can’t control that. I said there is nothing we can about that, we have to let it go. The call has been made and the decision has been done. We have to get that point back,” said middle blocker Samantha Middleborn. The compelling third set came down to the wire, but BYU-Hawaii beat CSUSB, keeping their season alive. The Seasiders played tough defense themselves, digging every spike and countering every serve the Coyotes sent their way. After a thrilling third set, the Seasiders carried their momentum into the fourth set, taking an early lead. 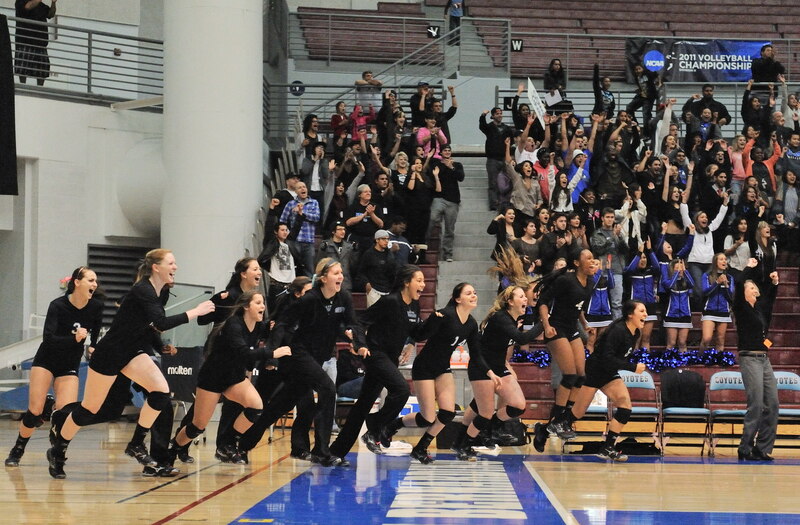 CSUSB woke up soon after and took control, winning the set and the game 3-1. Though they proved to be a worthy opponent, in the end the Seasiders were just another team who bit the dust against the Coyotes. 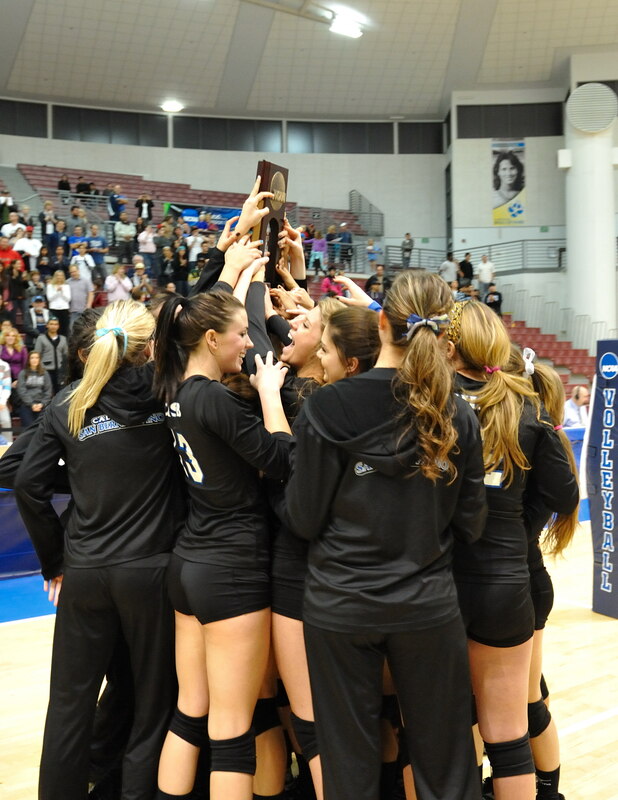 The final match for CSUSB was a well-played game versus number 3 seed, Sonoma State. The Coyotes won 3-0 with an attendance of 829, the largest of the tournament. Samantha Middleborn continued dominating the net with a game high ten kills. As a team, the Coyotes put a stop to Sonoma State. 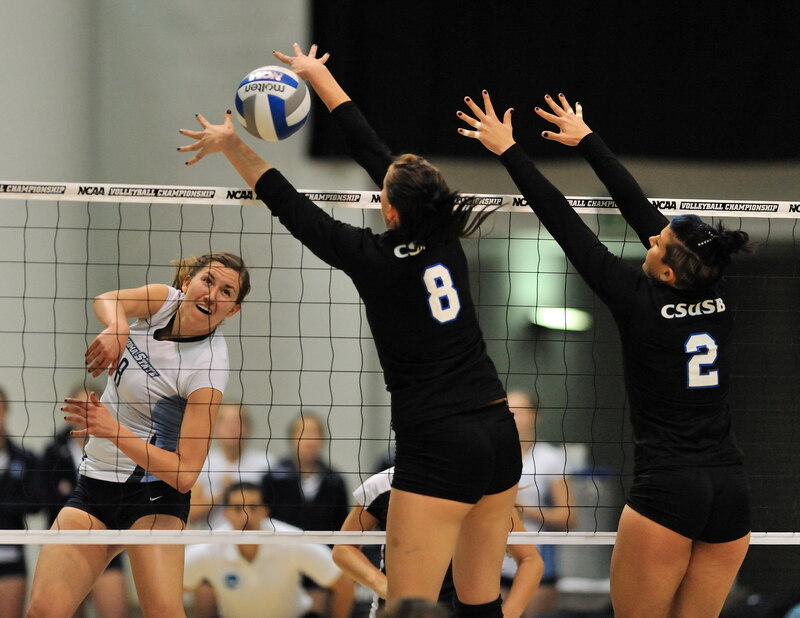 CSUSB only allowed their opponents 31 kills and forced 26 errors on 123 attacks. Sonoma state managed a lowly .041 hitting percentage. The Coyotes did not trail during either of the first two sets and left Sonoma state in the dust. The third and final set proved to be much more difficult than the first two. At one point, the Coyotes fell eight points behind. “We are never so concerned with they’re in the lead. . .you know we can close this. We’re going to come back. We have so much faith in ourselves, in our team and in each other,” said Middleborn. “What can I do to win this game? Whether we’re down or up, we’re always hungry like that,” said Camille Smith when asked what was going through her mind when the team was falling behind. The ladies regrouped and came back to battle point for point until game-point. Middleborn took the final attack for the kill, giving the Coyotes a 26-24 victory in the third set for the West Regional title. When it comes to nationals in December the team is focusing on one game at a time and is only focusing on the games as they come. CSUSB will face the winner of the WINGAT-FLAG match on Dec. 1. Concordia St. Paul, who has previously knocked CSUSB out of the championships multiple times, is still in the running for the National Championship. CSUSB put in a bid to host the championships. With an undefeated record, the Coyotes expect no less than to be declared the host.